Join me as I catch up on projects and the craft cabinet makeover using supplies from Container Store and discover how so many kitchen storage items will work for making your craft cabinet look gorgeous! We have a digital book giveaway! The ever so gracious Heather Ordover of CraftLit and MamaOKnits is providing a digital copy of her newest book Grounded. 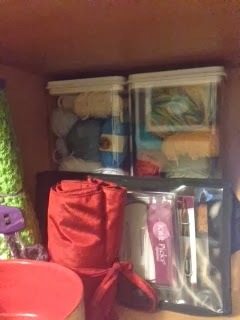 Here you can see the abyss that my craft cabinet had become... the left side dedicated to fabric and sewing supplies and the right side crammed with crochet and knitting stuff. While I was at the Container Store, I found these Small Double Cabinet Shelves that really helped me divide up my yarn. As you can see from the big open space in the middle of the cabinet unit, one large area became divided into three shelves. This really allowed me to sort out my yarn a lot better than what I previously had. I also found these pasta containers (at the back of the picture) that helped me store my leftover yarn scraps which are all wound into little balls. Here is the finished look of the crochet and knitting side of the cabinet. Much better, right? I'm pretty pleased with how it looks now compared to the state of chaos that it was in. I'm hoping to find even better ways to keep things organized as I move forward. Thanks so much for listening today and I hope you’ll join me again next time. Feel free to contact me at shortyssutures@gmail.com, comment here on the blog, reach out on Ravelry in the ShortysSutures Group, comment where this podcast is hosted at shortyssutures.libsyn.com, or look me up on Facebook, Twitter or Pinterest. And please consider leaving a review on iTunes to help other podcast listeners find us.